Not sure which way you're suggesting this loan was made there, but I don't think this is a loan at all. This root is common to Arabic, Ge'ez, Sabaic and most of the South Semitic languages. The root meaning is "to rise". Waleikum salam! 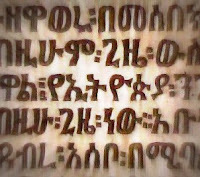 When I saw በሠርቅ in the text for ἐν τῇ ἀνατολῇ I assumed it was simply the cognate for الشرق, but then I couldn't find the root listed in Leslau (maybe I missed it?) so I posited that it might be a loan. Thanks for the correction Abu Rashid! It is mentioned in Leslau's comparative dictionary, and it's listed as a cognate of the Arabic and South Arabian, not a loan. Personally I think linguists have been a little too liberal in declaring words to be borrowings amongst the Semitic languages. There almost seems to be a pecking order of Hebrew -> Aramaic -> Arabic -> Ethio-Semitic. So if a word exists in Hebrew & Aramaic, and is not so common in Aramaic, the natural assumption tends to be it's borrowed from Hebrew, and so on. This is of course purely based on Western perceptions of cultural superiority. Hebrew & Aramaic being Biblical languages are perceived as first class, and Arabic having a much more successful cultural history than Ethio-Semitic makes it ahead of those languages. I may be reading too much into it, but it's just the impression I get when reading material that deals with these issues. While we're (sort of) on the subject though, I'm assuming from your comments that you know / are familiar with Sabaic? If so, (a) that's fantastic! and (b) could you direct me to any resources on it? Also, more generally, what do you do / study? Actually I am of the opinion the Aramaic/Syriac influence on Arabic is very much overstated. Surely there are some words borrowed from that language, but nowhere near as many as are claimed. Due to the fact Aramaic has undergone radical sound mergers, it's very easy to debunk these claims. I have read a little on Sabaic. As not much survived of the language, there is very little to go on. I have a Sabaic dictionary (English/Arabic/Sabaic) which is very helpful, and have also read bits and pieces about the language in various books about the Semitic languages (some of them listed below). The Sayhadic (or Old South Arabian) languages, of which Sabaic is a member, share quite a lot in common with Ge'ez, and of course the Ge'ez script is derived from the Sayhadic script, the "Musnad".